For many years, folks thought the name of this band was Creation Of Sunlight. But thanks to rock and roll sleuths, the truth finally came to light. Sorry, I can never resist a pun! 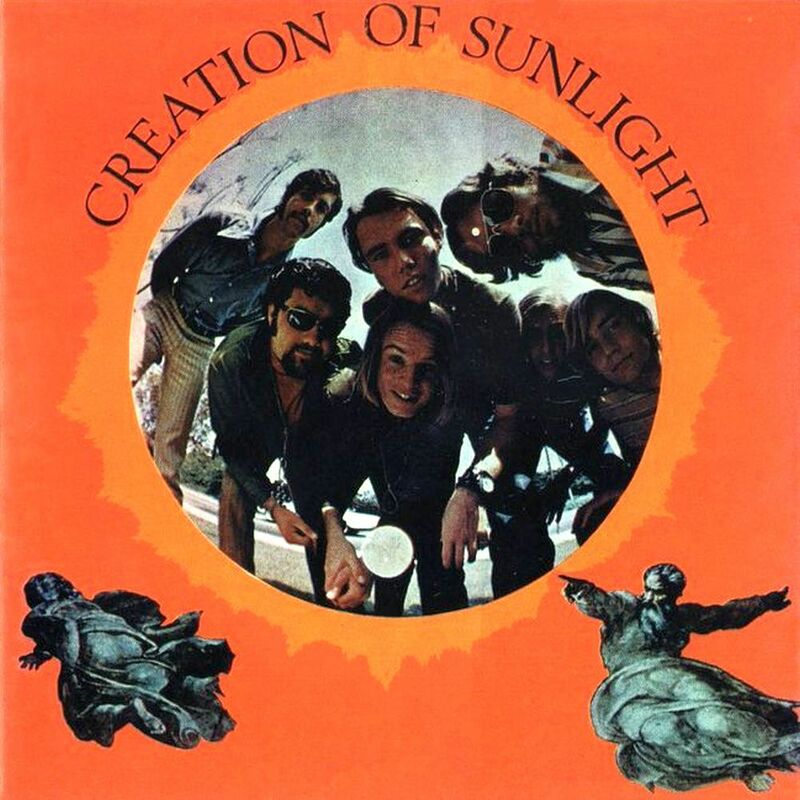 In any case, Creation Of Sunlight, which was Sunlight’s only album, initially appeared on the Windi label in 1968 in a limited run of five hundred copies. Remarkably obscure, the album was bootlegged a couple of times, but this platter is the one to get. Aside from being a legitimate release, the sound quality is excellent, plus bonus tracks and liner notes are included. Starring Gary Young on lead vocals, Carl Estrella on lead guitar, Don Sain on rhythm guitar, Steve Montague on bass, Jerry Grifffin on keyboards, Bob Morgan on drums, and Ron Clark on percussion, flute, and saxophone, Sunlight expertly bonded commercial aspirations with an experimental rim. The band’s handle certainly suited them, as their sharply scripted songs were bright and cheery. High spirited harmonies, not unlike those of the Association and the Strawberry Alarm Clock, pervaded the plot, while Sunlight’s jazzy psychedelic pop instrumentation easily draws parallels to the Doors and Iron Butterfly. The constant presence of a whirling and curling organ supplies the material on Creation Of Sunlight with a rich and deep tenor, where the guitars alternately ring and reel with excitement. Every single song on the album is seriously fantastic, but my personal favorites are the swinging vanilla soul of “Rush Hour Blues,” the sweeping glee of “In The Middle Of Happy,” and “Fun Machine” that involves a tight and insistent jam. “Seven Times Infinity,” “Hammond Eggs,” and “Second Thoughts” are other songs I keep returning to, not to mention a smoking hot tribute to John Fred and The Playboys in the form of “Judy In Disguise (With Glasses)” that was pressed as a single and was not originally featured on the album. Driven by an optimistic mood, both lyrically and sonically, Creation Of Sunlight is a perfect example of flower power rock done right. Bathed in rays of juicy melodies, blissed-out singing, and progressive tempos and arrangements, the album offers endless treasures. It’s not hard to hear the joy Sunlight experienced cutting the record, and we can only imagine where their subsequent steps would have taken them had they continued making music. One of the great obscurities of the '60s and one of the finest albums in all of Rock. With a song like "Seven Times Infinity" these guys should have been stars. A must for any Rock collection.